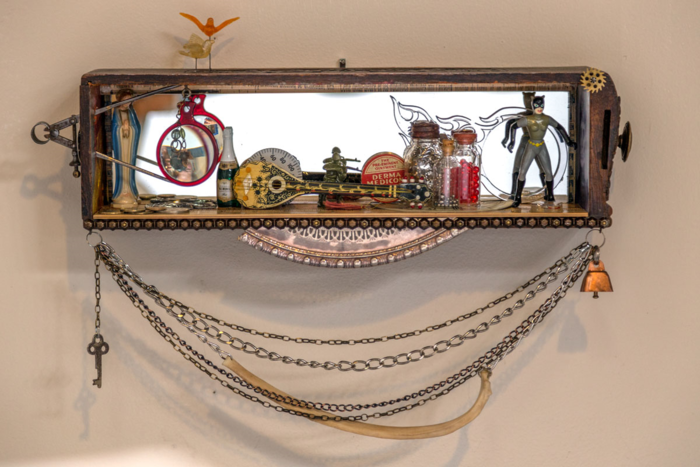 Rebeca Treviño has spent the better part of her life creating stories in a 3-D form from found objects. As story teller, she unsuspectingly lures the viewer into her work, first with an immediate response to the visual impact of color and composition, and then with a blindsided hook that makes it impossible to walk away. At times, her "unwritten stories” run as deep as the viewer dares to go, while others reveal with the simplicity of a nursery rhyme. Rebeca’s art materials are salvaged from long forgotten relics that have somehow ended up in a junk drawer, a flea market or garage sale, where she will breathe new life into these abandoned relics in a way that can be unexpectedly provocative, politically suggestive, and unquestionably deliberate. “What’s Inside”, Rebeca’s body of work, presents introspective, but is keenly charged with the wit and wisdom of a perspective on everything from world wars to childhood dreams to religious ideology. Each of her constructions provide the viewer a glimpse to see things beneath the surface. A lifelong collector, Rebeca’s studio is a treasure-trove of children’s toys, vintage tools and other unusual objects. Her palette is composed not of paints but of parts and scraps scavenged from constant trips to flea markets, estate and garage sales. Her method of working is best characterized by the various roles she has chosen to play, to include that of collector, editor, builder, juxtaposer. Rebeca's work has been exhibited in galleries from California to New York and, and can be found in private collections across the country and abroad. She makes her home in Northern California. 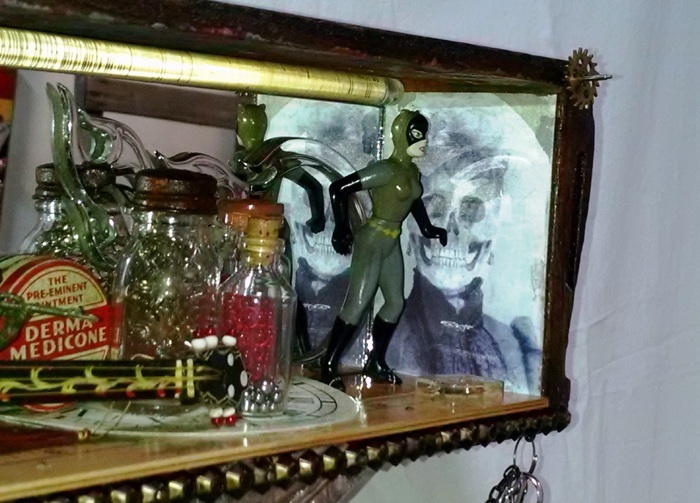 Constructed in a vintage sewing machine drawer, this diorama is full of interesting bits and mementos meant to challenge consciousness and provoke memory. Regardless of our intentions, our actions, ideas, proposals, policies all have consequences, some are good and some are not. 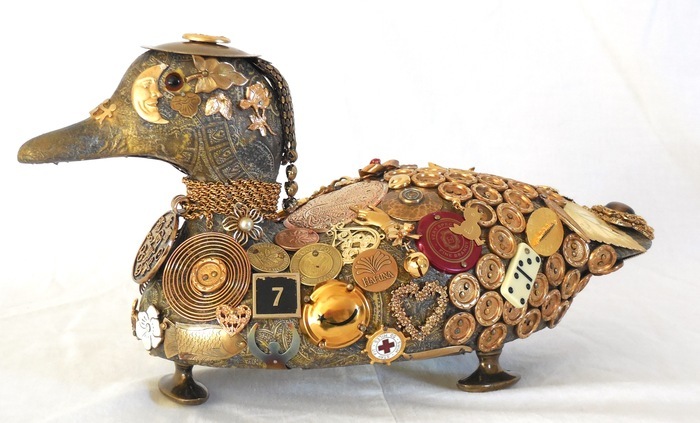 "Legend of the Golden Duck"
I make "memory" pieces. 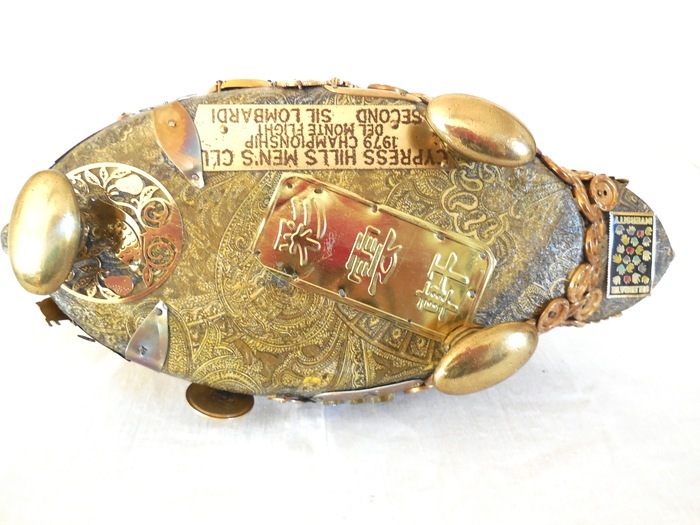 Memory pieces are art pieces typically start out being a recognizable wooden form, a frame, a box, an an animal form, then I will usually 'paper' the piece with a selected color, and then I begin to 'embellish' it with bits and bling. I typically work with silver-toned bits and bling, for no real reason except that I like the way the silver looks. Looking back on when I was working on this piece, I realized I was working on 3 pieces at the same time, a mirror, a mannequin head and this duck . . . and all three were in gold tones. 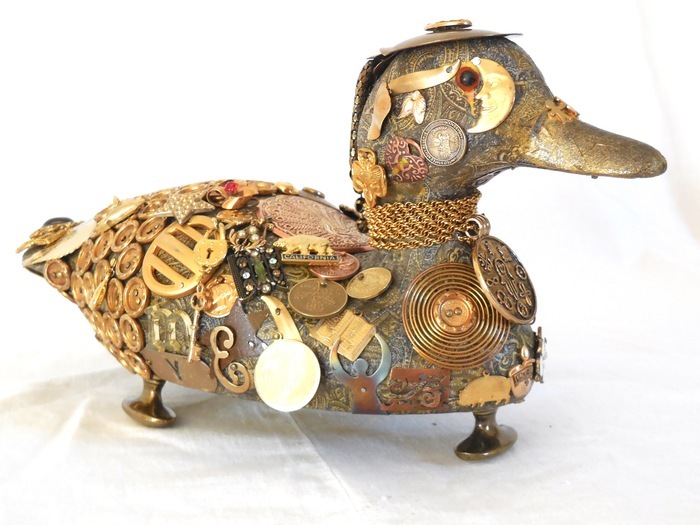 The title for this piece is inspired from a children’s activity book titled: “The Legend of the Golden Duck”.